Hello Everyone and Happy Friday! I'd like to apologize for not having any videos posted the last few days. My goal for this week was to post a video each and every day. Unfortunately, on Tuesday afternoon after picking up my daughter from school, she came down with the nasty stomach bug. It was not pretty and she was in need of a lot of attention. It lasted for 2.5 days and now my husband has come down with it and my son also has some mild symptoms. I'm doing everything in my powers to not catch it, especially with it being so close to the holidays. Thus for, the lack of content these last few days. But this evening, I do have a rather quick and simply card to put together. I love when a card design comes together rather quickly, as there is always some last minute Holiday cards that need to get sent out that get forgotten about. 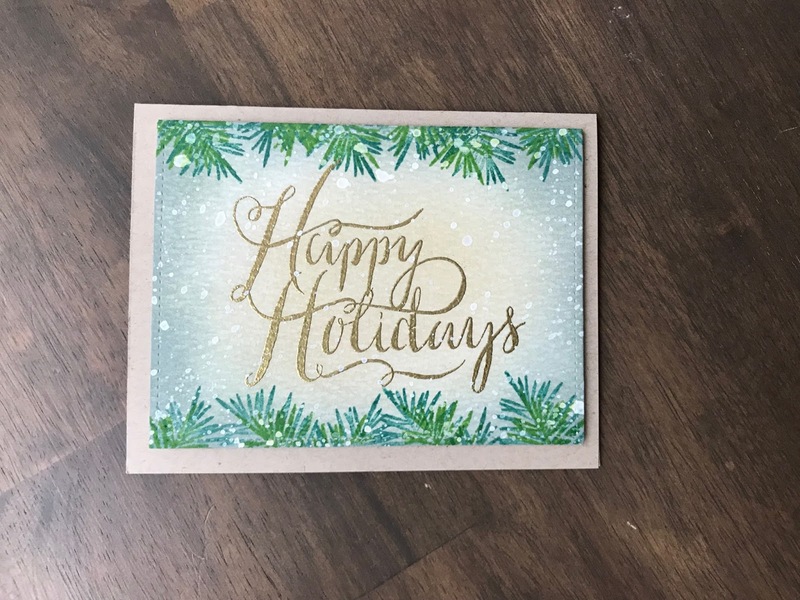 I absolutely love ink blending with Ranger's Distress inks and todays card incorporates ink blending, as well as some stamping, heat embossing, and watercolor splatters. Hey Everyone.....there is exactly 1 week until Christmas! Seriously this month has just flown by in hyper speed! Today I'm using some Neat & Tangled Products to create a Sweater Background on my card set. 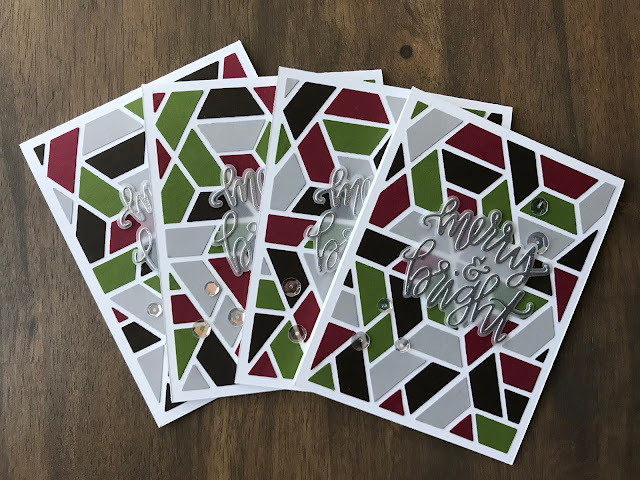 I die cut the Polygon Cover Plate out of 4 different colors and paired it up with the Neat & Tangled Merry & Bright Dies to create a set of 4 Holiday Themed Cards. I hope you guys enjoyed this set of Holiday Cards. 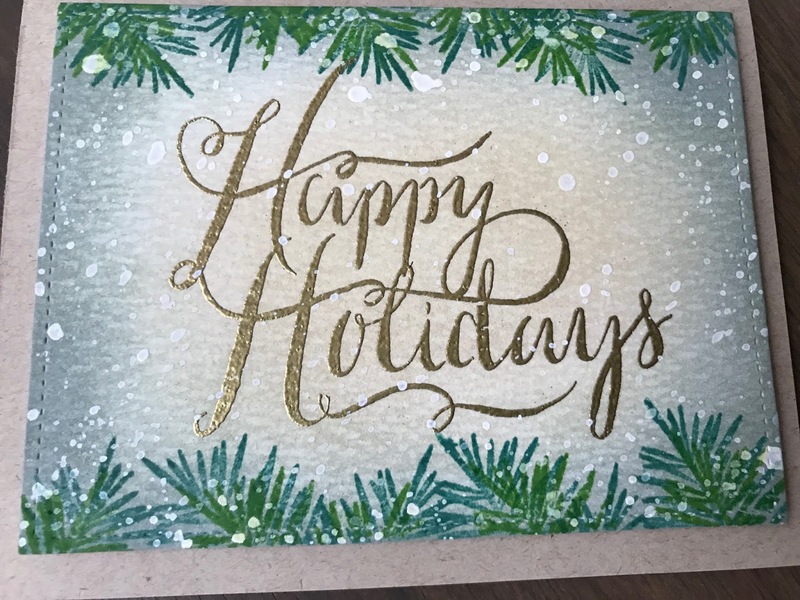 I love being able to use a non-holiday related product to create holiday themed cards. It really forces you to stretch your products and get the most out of them! I'll be back soon with Day 5 of the Holiday Series for 2017! I'm back today with Day 3 of the Holiday series for 2017. Today I'm showing you how I mass-produced my plaid background Christmas cards that were mailed to family and friends. 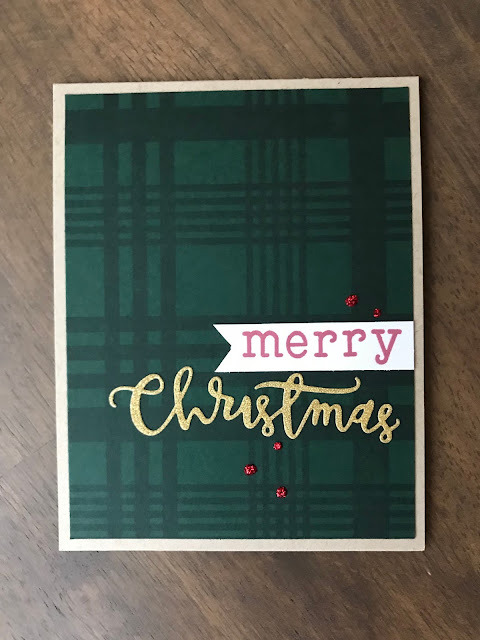 I have seriously been eyeing up the Concord and 9th Plaid Background Stamp Set for quite some time but hadn't purchased it in time to use on creating my Christmas Cards. So I went through my stamp stash and came across a stamp set from Clearly Besotted called Basic Stripes. 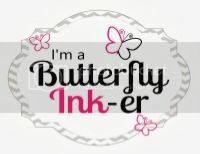 Unfortunately, you can't find this stamp set on any of the major online retailer that I used, however, Simon Says Stamp has a Basic Stripe Stamp Set that would work perfect! This year I wanted to mix up the sentiment a bit, so I used Lawn Fawn's "Clark's ABC" to spell out merry and Simon Says Stamp's "Christmas Blessing" Die. Unfortunately, Clark's ABC (which happens to be one of my favorites) is a retired stamp set, however, Lawn Fawn has a TON of alpha stamp sets! 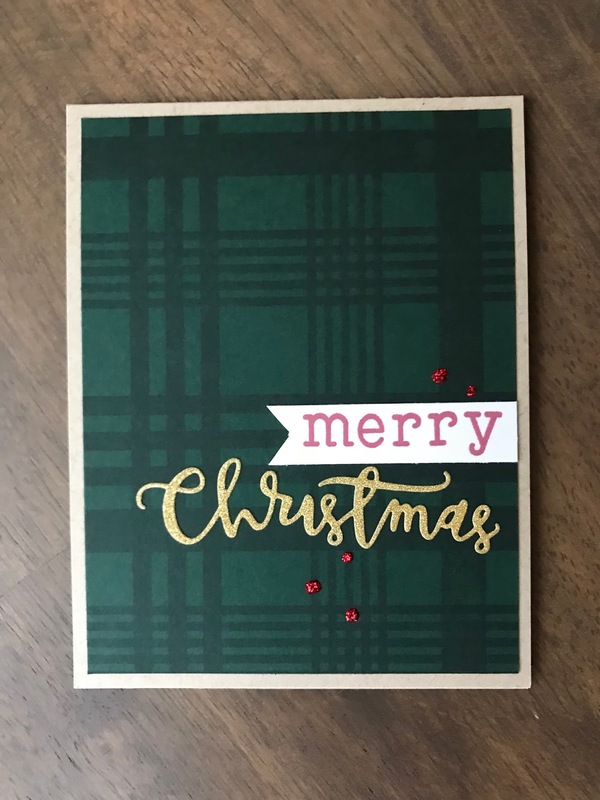 Here's a video showing how I created this plaid background and put together the rest of the card. I also talk about some tips/tricks that I've learned over the years when creating 50 holiday cards. I hope this gave you some ideas and tips on how to mass-produce some holiday cards. I really loved creating these cards! I'll be back soon with Day 4 of the holiday series for this year. Hello Everyone! I hope that your week is off to a fantastic start! I cannot believe that Christmas is less than 2 weeks away! Where has the time gone? Unfortunately, last week I was having some computer difficulties and was not able to post some projects but we are back up and running! Today, I have Day 2 of my Holiday Series this year and I'm using a stamp set that may not be a Holiday Stamp set but by changing up the colors I've made it feel more like a Holiday Card. Concord & 9th's Flourishes Stamp Set is a great stamp set and can be changed up for many different occasions. I paired that up with Lawn Fawn's Scripty Joy Die to complete this card. And you all know that I cannot complete a card without a little bit of shimmer, so I added some Wink of Stella Clear Glitter Brush Marker on all of the flowers on my card. I'll be back soon with Day 3 of the Holiday Series and you can find all of the supplies used on this card down below. Hello Everyone and Happy Monday! Also, hello December....how did you get here so fast?!? I swear that the year has honestly FLOWN by and this month does not seem to be slowing down at all. I'm so excited to be doing a Holiday Series this year...I could not believe when I looked back and saw that the last time I did a Holiday Series was 3 YEARS AGO! But I'm incredibly excited to be presenting again this year here on my blog and youtube channel. My goal for this series is to complete 12 Holiday projects. I have way more than that sketched out and floating in my brain, however, I am a stay at home mom to 2 very young kids and time for myself can be very limited. So I've set a goal of 12 projects but if I surpass that, I'll be ecstatic. Onto Day 1 - Dimensional Snow Tree Card. I have to admit that this card was created last year, it simply never got posted, so it does involve using a stamp set that is a little older but is a fantastic one for your holiday collection. The stamp set that I am featuring today is Hero Arts "Color Layering Christmas Tree" and I'm pairing that with some White Liquid Appliqué to give the tree some really fun dimensional snow. This card would also be incredibly easy to mass produce, especially with the use of the MISTI, which at the time I did not own last year. Hope you guys enjoyed this card and I'll be back soon with Day 2 of the Holiday Series.